I'd like to start a post about a subject that took me some time to discover and appreciate in Sweden - sausages. Perhaps due to it's not-too distant roots as an agricultural society, there's a pretty heavy-duty sausage tradition in Sweden. I think what made me miss this during my first years here was the huge amount of cheap, nasty sausage and hot dogs that abound on the Swedish market. However, with some careful searching, one can still find some special and tasty remanants from Sweden's sausage past. Stångkorv has a unique semi-soft texture that can be seen in a few later pictures after it's been cut. Traditionally, it contains whole grains of barley but it looks as if Wurst Master has replaced the barley with buckwheat (perhaps to make the product gluten-free). I'm not positive of the seasoning but the flavoring is peppary (black peppar) and I tasted cloves and/or allspice, nutmeg and/or mace and I swear a bit of juniper berry lodged itself in one of my molars as I was eating. 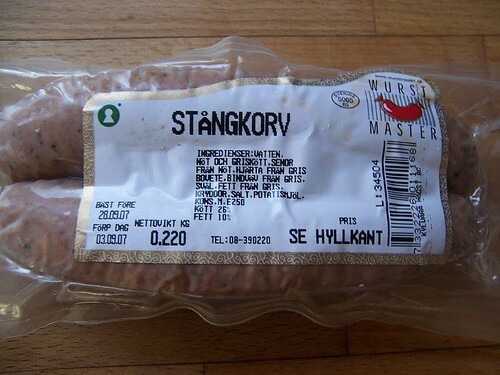 You probably can eat stångkorv as you would any other sausage. 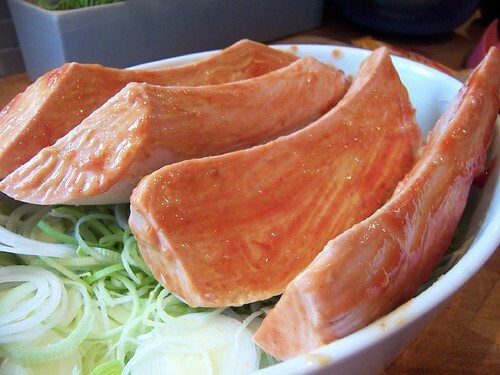 Traditionally, it's probably sliced in rings, seared in a hot pan and served with pan-fried potatoes. 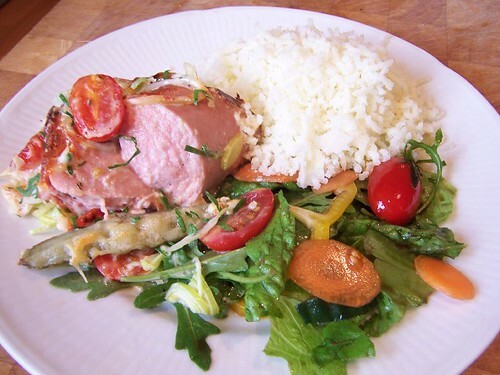 However, the variation I prepared yesterday is called "Stångkorv special". 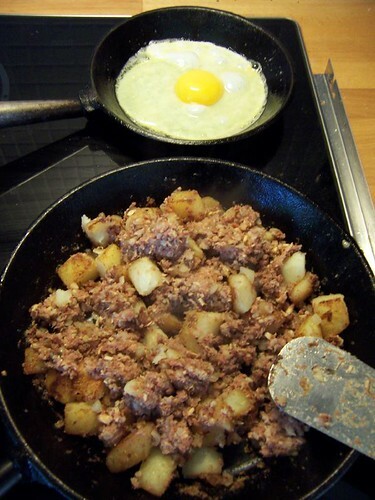 Start with: equal weights of sausage and cold, cooked potatoes, about 1/2 onion, an egg and some butter for frying. 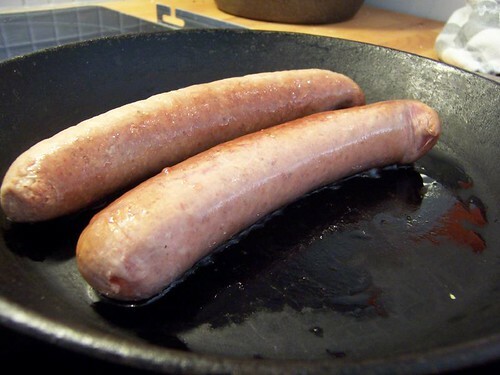 The "special" preparation involves removing the casings on the sausage. After doing that, slice the sausage in 1/2 inch pieces. Dice or slice the onion. 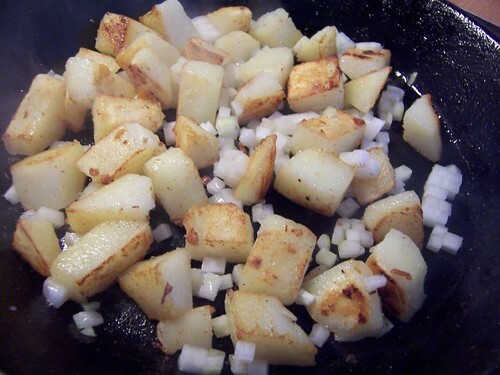 Pan-fry the potatoes in the butter. It will immediately begin falling apart. 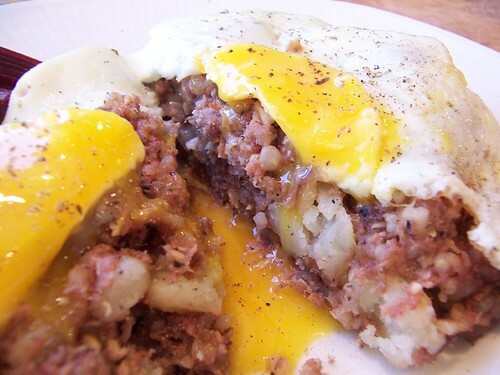 What we're making is essentially a sausage hash. Let it brown, scrape up the crusty bits and let it brown some more. Connective tissue never tasted so fine! My breakfast of toast is really not holding me over as I look at these pictures. 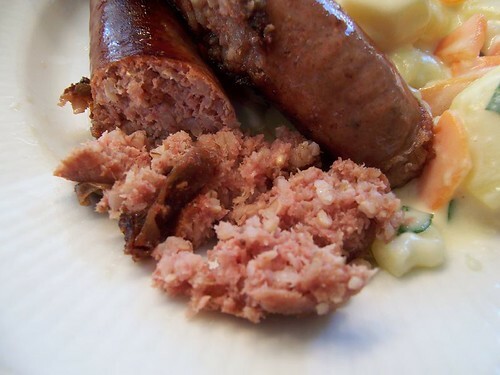 Although I'd imagine that the texture and flavor of that sausage, especially considering the high offal content, makes it something completely unheard of on our side of the pond. Beautiful. 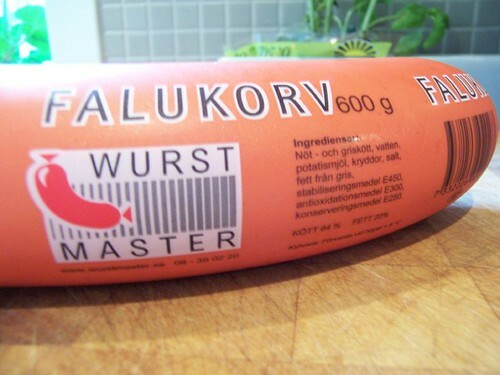 If this post's first entry featured an uncommon sausage, this entry's focus is still quite popular in Sweden. Isterband translates to something like "lard sausage" - "ister" meaning lard. It is not an emulsified sausage and therefore should have a grainy consistancy. 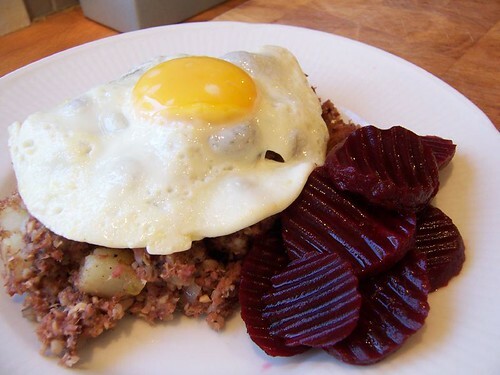 The mixture of beef and pork is also given a healthy addition of barley groats. Isterband has two defining features. Firstly, this sausage is slightly dried and cold-smoked. The majority of smoked sausages over here are otherwise warm-smoked. 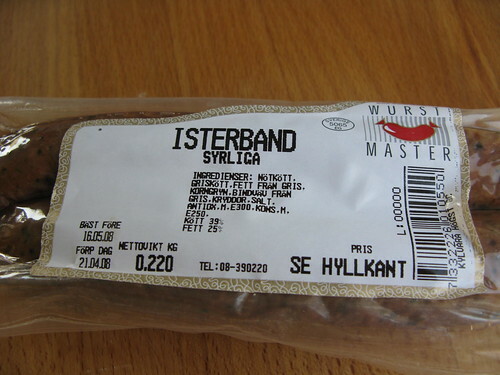 Secondly, isterband is a fermented sausage. Depending on the manufacturer, these things can be sour! So the major tastes here are smokey and sour with perhaps a little peppar or allspice in the distant background. It's actually a pretty complicated sausage, flavorwise. I've found a recipe(in English, even) for isterband but I'm not certain as to how easy it is to get the fermentation going at home. While there are normally 3 or even 4 different brands of isterband available at nearly every grocery store in Sweden, I went the hard route and tracked down an exclusive, handmade version. What I ended up with was the meanest, sourest and smokiest isterband of them all. I've forgotten the manufacturer's name (some small farm in the deep forests of South Central Sweden) and it may not look like much but these babies packed a punch! 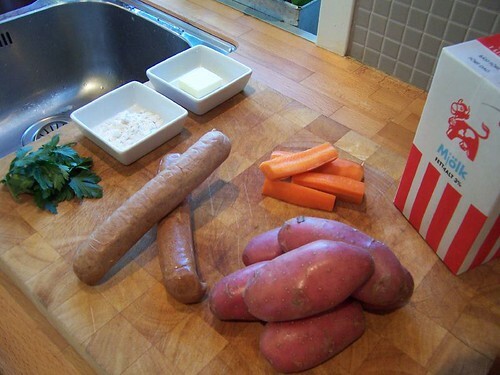 Butter, milk and flour for a bechamel sauce, parsley, cooked potatoes*, a carrot and two isterband sausages. 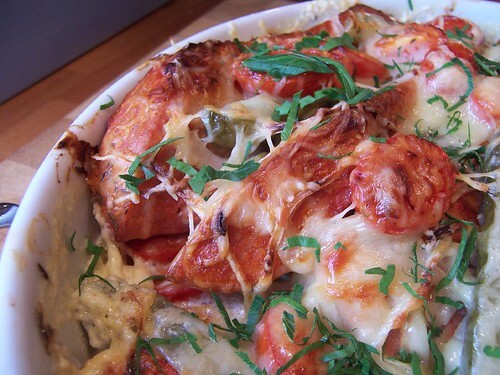 Start by making a bechamel. Peel and slice the potatoes. Add the thinly sliced carrots to the bechamel sauce and let bubble for a minute or two. 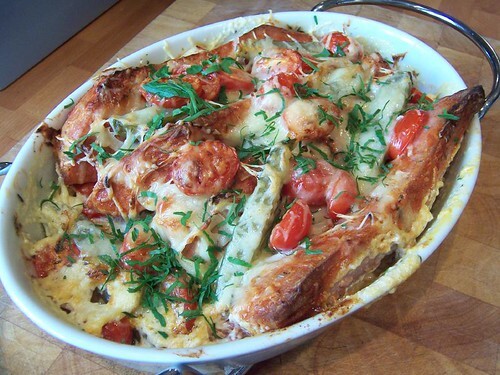 Add the sliced potatoes to the carrots and bechamel and let the potatoes get warm. Meanwhile, prick the sausages and put them in a dry pan. Heat slowly at low to medium low temperatures (you'll want to render some of their fat before they get too brown). You can see how soft this sausage is. It's difficult to cut through the skin without the filling falling out. In fact, many people split the isterband lengthwise and scoop out the filling to eat. This particular version of isterband is excellent but certainly nothing for the non-initiated. They were smokey enough to leave my clothes smelling of smoke despite having the exhaust hood on medium. And the sourness was, once again, extremely powerful. However, all in all, isterband is another throwback to Sweden's agricultrual past that somehow still lives on. And, as proof of how effective smoking and fermenting can be in preserving food, these sausages had sat in my refridgerator (merely wrapped in butcher paper) for nearly a month before I got around to cooking them! I'm fascinated by this thread--as with all your Swedish food posts, Bridgestone. In the Upper Peninsula it's common to find a sausage called a "Swedish potato sausage" in the stores. Is that still common in Sweden or is it one of those things that left with the emigrants? Are pickled beets a common side in Swedish cuisine, or just a favorite of yours? 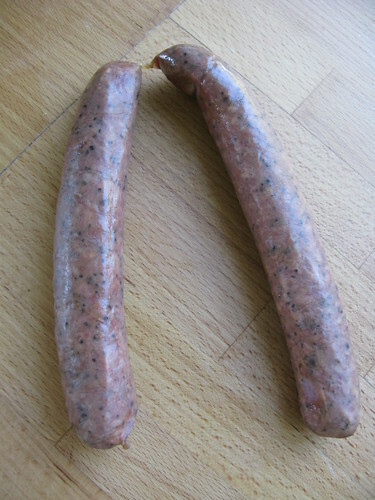 Ann Fisher wrote: In the Upper Peninsula it's common to find a sausage called a "Swedish potato sausage" in the stores. It's available at Tre Kronor as an optional breakfast side and part of my typical breakfast order. Bridgestone wrote: If this post's first entry featured an uncommon sausage, this entry's focus is still quite popular in Sweden. Thank you for yet another window into your Swedish Kitchen, the view is spectacular and the glass clear and clean. brandon_w: Well, I do like pickled beets a lot but they are definately common for this type of food in Sweden. 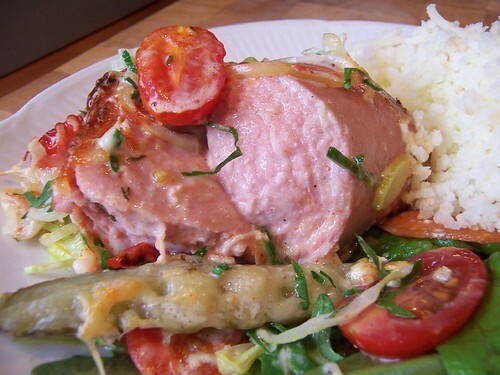 Their sweetness and sourness acts as an excellent foil to the fatty, rich sausages. Beets (both red and sugar) are, in general, very common in Sweden. They must like the soil! Ann Fisher: From what I can tell, the product known as "Swedish potato sausage" still more or less exists in Sweden. 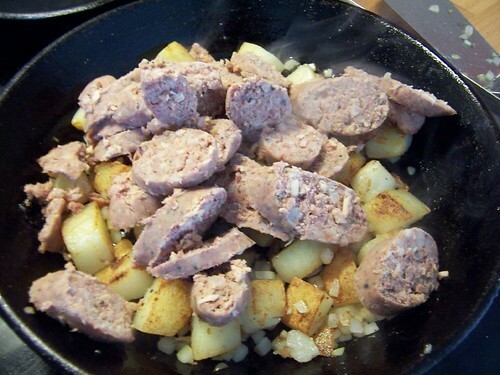 Here's it's occasionally called a "potato" sausage but more often simply a "pork" or even "meat" sausage. They are sold raw and then poached before serving. One will probably and eventually show up in this post! Bridgestone wrote: Their sweetness and sourness acts as an excellent foil to the fatty, rich sausages. 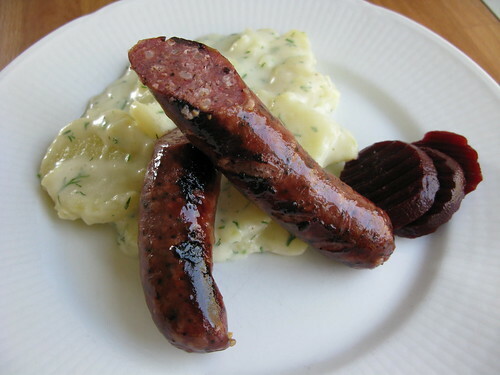 As an aside, it seems quite natural to me to serve pickled beets with Wisconsin brats. Beets, in various forms, seem to go with most anything. Hummm, beet ice cream anyone? 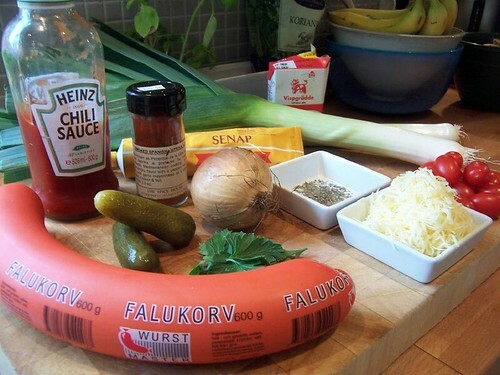 Falukorv, by far Sweden's most popular sausage apart from the hot dog, is a sausage with a long, distinguished history and a proud torchbearer of Swedish tradition. Falukorv (literally, "sausage from the town of Falun") is forever linked with the town where it was first produced: Falun. 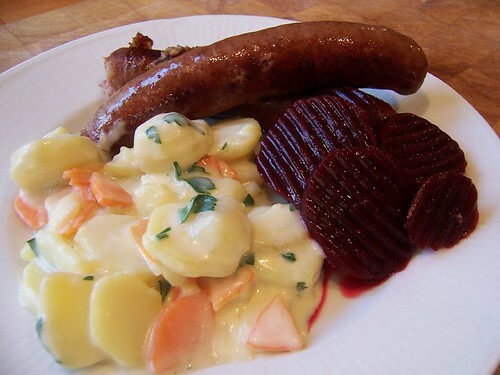 Specifically within Falun, the sausage is essentially a by-product from the town's illustrious, UNESCO-listed copper mine. Retreiving the copper ore from the deep mining pits required oxen. Lots of oxen. Starting in the 1500's, they were driven up in herds from southern Sweden and slaughtered upon arrival. Why? Well, it was their hides that the miners were wanting. The hides were made into ropes and the ropes were used to bring the ore out of the mine. The meat, much too much for the miners themselves to eat, was salted, smoked and preserved. However, German engineers were brought to the mine and at least a few of the brought their sausage-making traditions with them. It wasn't too long before the preserved ox meat was being turned in sausages. Falukorv is such an intregal part of Swedish society that the name has been protected (first nationally within Sweden and now backed by the European Union). 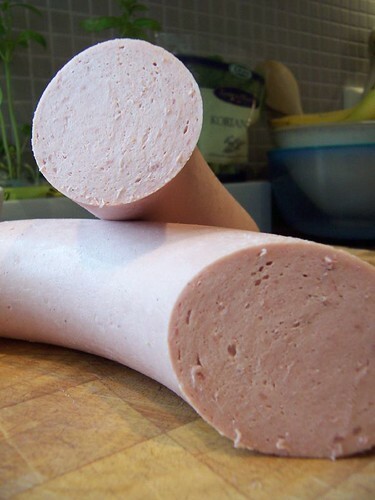 To be called a "Falukorv", a sausage must, for example, be at least 40% pork or beef meat (not offal). To me, 40% isn't too much as I actively search for quality sausages but for many of the sausages on the Swedish market, 40% is sadly a tough goal. Falukorv is on nearly every daycare and workplace weekly lunch menu and shows up in music, tv and film. One could practically translate the saying "American as apple pie" to "Swedish as falukorv" without too many Swedes batting an eye. I never ate falukorv much until a few years back. It's super-emulsified and very mild in flavor. It's also (to my taste) extremely salty. 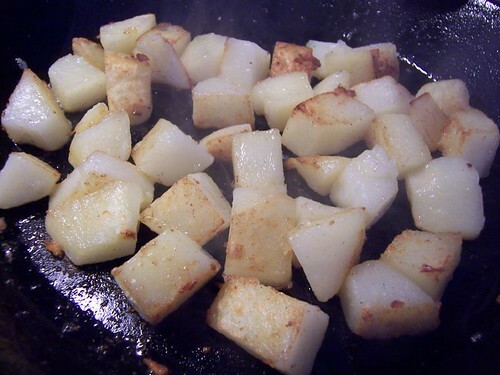 The preferred preparation of quickly browning slices of falukorv in a dry pan and serving with fried potatoes and mustard just wasn't doing much for me (more than waking me in the middle of the night to scramble after a glass of water). However, I stumbled across a few preparations a few years back that have made me rethink my views of falukorv. Sure, it ain't pretty but, prepared lovingly, it can make a tasty dinner. Falukorv, chili sauce, pickles (these are salted, but not seasoned with dill), parsley, paprika, mustard, an onion, thyme, grated cheese (use a good cheddar, for example), about 1/2 cup cream, a leek and some cocktail tomatoes. It's made by my beloved "Wurst Master" so I trust the ingredients. It's also not as salty as many of the other premium falukorv. 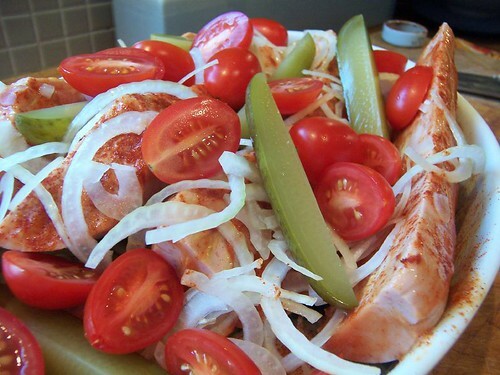 Sprinkle the sausage with paprika and cover with sliced onion, halved tomates and quartered pickles. Trashy, sweet, fatty and really, really good. It's a little ironic how many of the quality Swedish foods that I try to highlight are unavailable in the United States while the homliest most likely is. 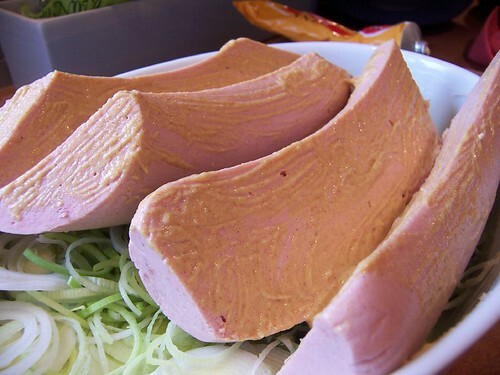 If any of you closet ring bologna lovers get the nerve up to try this odd dish, I don't think you'll be disappointed. It may not be a silk purse but I'm certain there's some sow's ear in there. Last edited by Bridgestone on September 28th, 2007, 12:27 pm, edited 2 times in total. Pickles and melted cheese you say? Sounds interesting. The picture of it hot out of the oven does look kind of good though. While I'll be the first to admit that this preparation of falukorv is unusual (as well as other things...), I would like to say that the last time I had the combination of melted cheese, meat and pickles wasn't on a falukorv but on a cheeseburger. Perhaps it's not as far-fetched as one may initially think. I guess now that you mention the burger it is not that far fetched, but I don't eat pickles, so they are never on my burgers. Bridgestone wrote: If any of you closet ring bologna lovers get the nerve up to try this odd dish, I don't think you'll be disappointed. It may not be a silk purse but I'm certain there's some sow's ear in there. Another particularly captivating series, the humble bologna has never looked so delicious. While I'm not an oft eater of bologna having had most of my life time allotment decades ago at summer camp in the twice weekly form of fried baloney w/BBQ sauce on white bread, I occasionally toss a 4-5 lb chunk in the smoker. Lightly crosshatch, slather with cheap yellow mustard so the BBQ rub adheres, smoke for a few hours until the edges get crisp and serve with a hunk of cheddar cheese. 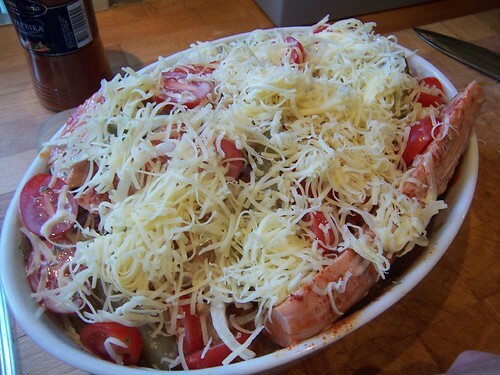 Makes a nice mid cook snack or rough and ready appetizer for a crowd. I'd read good things about this particular manufacturer's version of Isterband so I gave it a spin for yesterday's lunch. "Low and slow" (in the pan) so that they get heated through without burning and served with pickled beets and creamed potatoes (with dill). The white bits in the sausage are barleycorns. How did these stack up? Well, it's probably unfair to stack these up against the first version I had. The first version were truly handmade, had been written up in newspapers and won several Swedish championships (yes, they exist!). They were also smoky enough to fill the house with their scent and puckeringly sour. These had not been noticeably smoked which I was initially disappointed with. However, I soon realized that the lack of smoke let the other flavors shine. The black pepper flavor was prevalent as was a strong flavor of allspice. They was enough fat to keep them moist and the sourness was honestly at a pretty comfortable and balanced level (if the first batch was a 10+, these were a 5). The fact that these are marketed as "Sour" speaks volumes to me of the quality of many of the other factory isterbands out there. All in all, an excellent "factory sausage" and definately a better beginner's version than my previous choice. 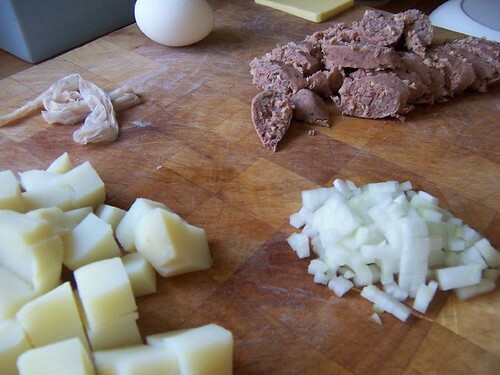 My favorite preparation involved thinly sliced potato-sliced onion- and my own addition- Granny Smith or any other semi-sweet apple sliced wafer thin topped w/ the sausage- and baked in the oven for about 20-25 minutes. 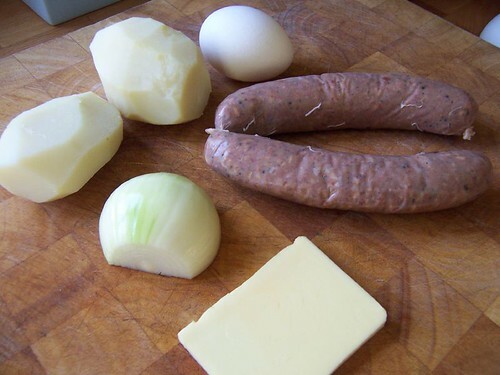 I would layer the ingredients in an oven dish- onions on the bottom- followed by potatoes- then apples- the isterband would then be lightly scored/cut every few inches down its length- just enough to keep the sausage from exploding- and to let the fat and juices flavor and cook the other ingredients. This would also serve to crisp it up nicely. The Potatoes picked up all the flavors and were to die for!!! YUMMY! - this was served w/ pickled red beets- - My *Sambo's mother from Koping made the best I'd ever tasted-Thanks Brittan wherever you are. Welcome to LTHForum, blchigrl! I'm glad I could hook you up with an Isterband fix. Your isterband preparation sounds truly inspired! I'll give it a try one of these days and report back to this post with my results. Thanks for the recipe/inspiration.